The Middle East never was a peaceful place to begin with; however the current volatile situation in many countries in the Middle East is something that even this region hasn’t seen in a long time. As the protestors in Libya are confronted with Army continues, the uncertainty in the region rises, and crude oil price continue to soar. Crude oil price (WTI spot) after rising on Tuesday by 8.55%, yesterday it increased by 3.13% as it reached 96.5$/b. With this recent rise, WTI spot reached its highest level since October 1st 2008. Furthermore, up to date, WTI spot price inclines during February by 7.8%, solely due to the last couple of days’ inclinations. Brent spot price also rose yesterday by 5.66% to reach 111.84$/b, after it increased on Monday by 5.1%. This is the highest level Brent oil has been since August 29th, 2008. During the month of February, Brent spot price inclined by 11.4%. As a result the spread between the Brent oil and WTI declined yesterday to 12.32$/b. Natural gas spot price (Henry Hub) after it inclined on Tuesday, yesterday it declined by 1.54%, to reach 3.83$/mmbtu and thus continued its downward trend during the February. As the cold harsh condition of the winter season will subsides, we will probably see an ongoing fall in natural gas prices. Furthermore, NY City gate price declined yesterday by 16.4% to reach 4.18$/mmbtu. Up to date, Henry Hub spot price declined during February by 13.3%, and the Henry Hub future (short term) price decreased by 10.3%. Gold price inclined yesterday by 0.92%, as it reached 1,414 $/t oz. Silver prices, much like gold prices, inclined yesterday by 1.36% and reached 33.304$/t oz. 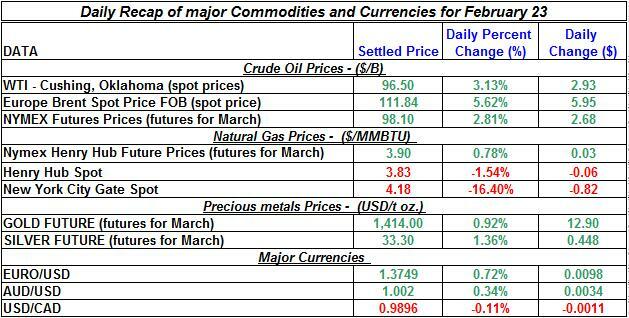 Up to date, gold completed a 5.5% rise during February, and silver completed a 16.8%. EURO/ USD inclined moderately yesterday by 0.72%, the USD also depreciated against the AUD, as the AUD/USD inclined by 0.34%. For a more detailed report on major currencies, check out Forex crunch.